Vocational School UGM dispatches 10 students to attend a student exchange programme in South Korea. There are 8 students from Korean Language Diploma Study Programme and 2 students from English Diploma Study Programme. They obtain an opportunity to study in Gangneung Wonju National University, Kyungnam University, and Kangwon University. 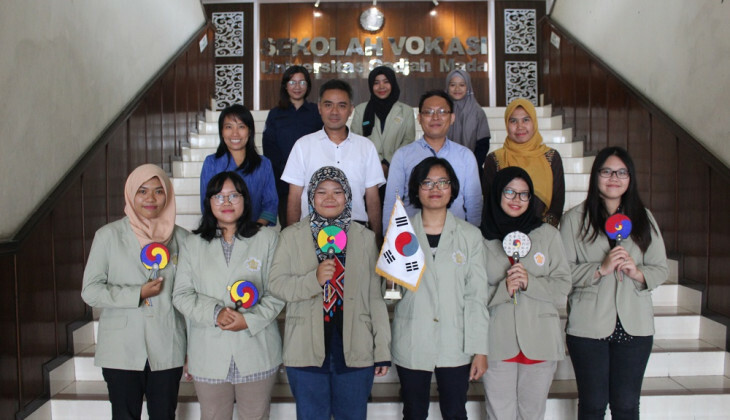 “Four students will study at Gangneung Wonju National University, two students at Kyungnam University, and four students at Kangwon University,” said the Head of Korean Language Study Programme, Supriadianto, S.S., M.A. on Thursday (8/2). Adi said the student exchange programme provides an opportunity for the students to study in South Korea from 6 months until 1 year. In this programme, several students obtain a full scholarship which covers their tuition fee, monthly stipend, round-trip flight tickets, and dormitory. Meanwhile, the rest of them obtain partial scholarship which only covers the tuition fee. “Through the student exchange programme, they are able to study Korean cultures, sharpen their communication and leadership skills as well as build international network,” said Adi. According to the plan, the delegates of Vocational School UGM will depart to South Korea on February 28, 2018. Previously, those students had been officially dispatched by Dean of Vocational School UGM, Wikan Sakarinto, S.T., M.Sc., Ph.D. assisted by the Head of Department of Cultural Arts and Management, Dr. Endang Soelistiyowati, M.Pd., the Head of Korean Language Study Programme, Supriadianto, S.S., M.A., as well as Manager of Office of International Affairs, Andri Handayani, S.S., M.A. on January 19, 2018.